John David "J.D." Hayworth Jr. (born July 12, 1958) served in the U.S. House of Representatives from 1995 through 2007, representing Arizona's 5th congressional district, which contains the suburbs of Phoenix. Before entering politics he was a sports broadcaster for KTSP-TV (a CBS affiliate in Phoenix). 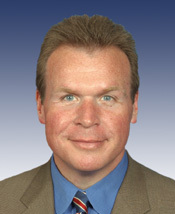 After an unsuccessful reelection campaign to the 110th Congress in 2006, he returned to broadcasting by launching a conservative radio talk show. An outspoken opponent of illegal immigration, Hayworth authored Whatever It Takes: Illegal Immigration, Border Security, and the War on Terror. Hayworth was a conservative candidate for United States Senate in 2010, challenging Senator John McCain for the Republican nomination. McCain and the establishment spent more than $20 million, and by some estimates close to $30 million, to reelect McCain. Despite outspending Hayworth by a 10-to-1 margin, McCain won by only 56% of the vote and benefited from the presence of a third candidate to split the vote against him. This page was last modified on 4 March 2013, at 12:06. This page has been accessed 10,349 times.